We know you are all going to love today’s guest post, from Erin of Dandelion & Grey! 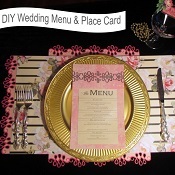 Erin is an event stylist with amazing taste; her work is always sweet, fresh, and full of vintage charm. Today’s post is perfect for summer, complete with lovely photographs by Olive Juice Photography. We broke up the recipe to go along with the pictures, but click the link at the bottom of the post to get it in its entirety…yum! Hello Everyone! I’m Erin from Dandelion & Grey. First off, I would like to thank Aileen & Ellen for having me guest post while they are away. Love & Lavender is always so inspiring and definitely a daily read of mine. I hope you girls are each having an amazing time! 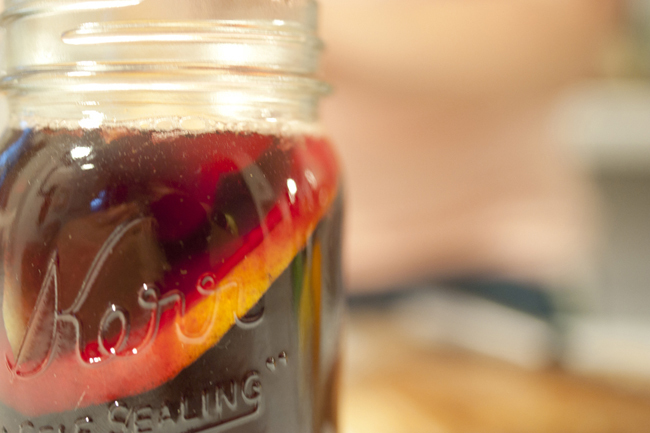 I wanted to share one of my all time favorite things with you… Sangria! I especially enjoy it in the Summer when the fruit is fresh and abundant and the temperatures are hot! 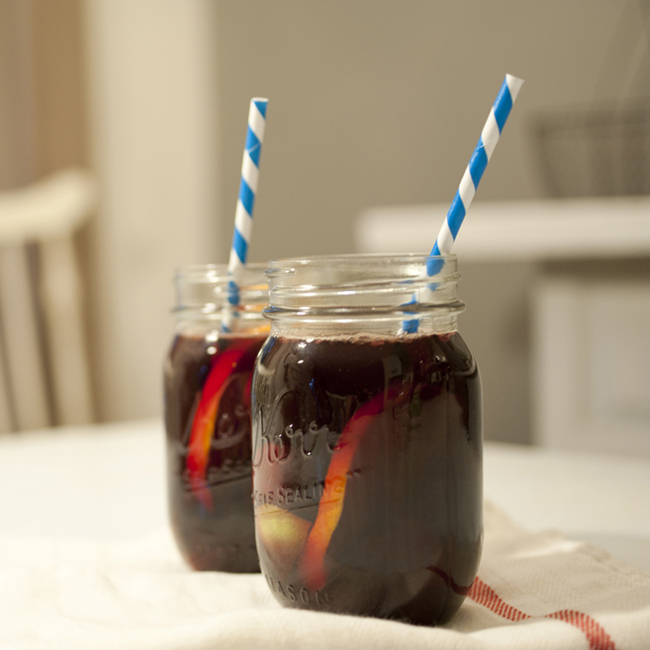 I think Sangria is a perfect and simple way to add a signature drink to your wedding drink menu. 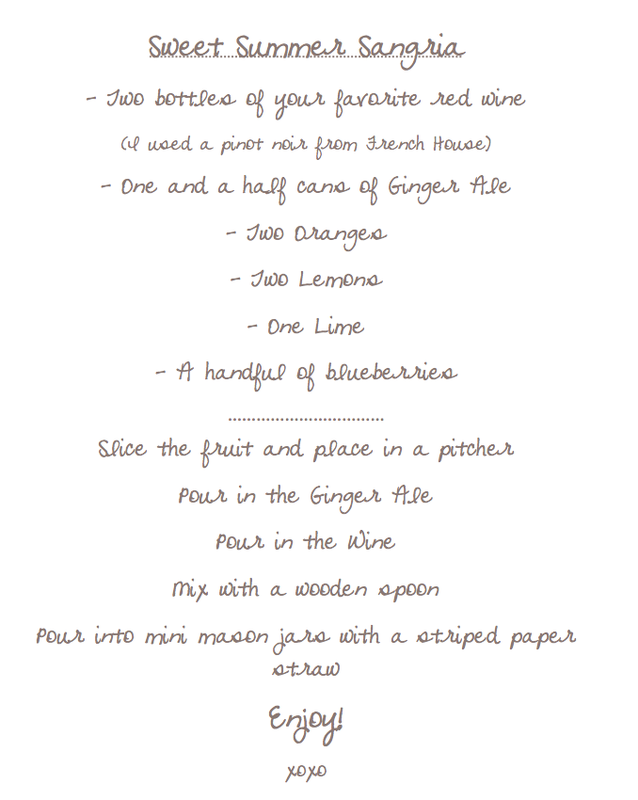 I created this refreshing recipe that would be super simple to multiply to make a large quantity for a wedding or event. 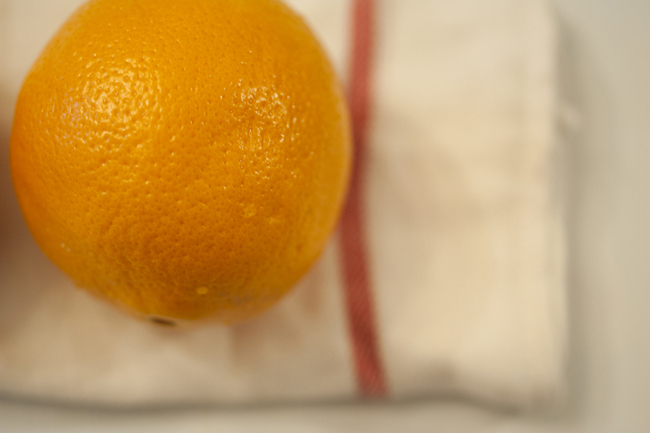 It’s also easy to adjust this recipe to your liking by swapping in your favorite fruit, or using white wine instead of red. I hope you enjoy this sweet summer treat as much as I do! Thanks again to the lovely ladies of Love & Lavender! 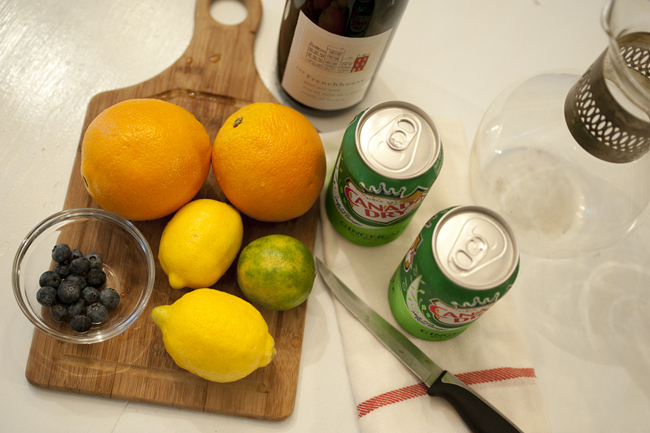 Ingredients: two bottles of your favorite red wine (I used Pinot Noir from French House), one and half cans of ginger ale, two oranges, two lemons, one lime, and a handful of blueberries. Slice the fruit and place in a pitcher. 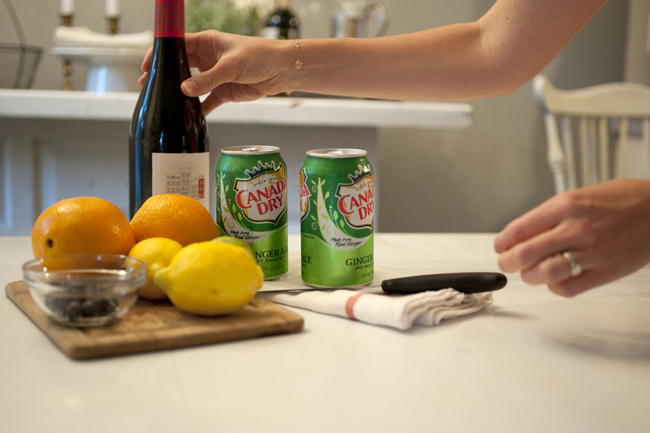 Pour in the ginger ale. Pour in the wine. Mix with a wooden spoon. 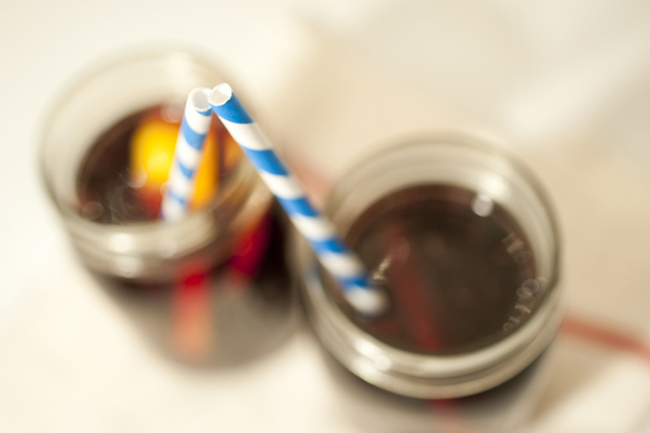 Pour into mini mason jars with a striped paper straw. Enjoy! Thank Erin! To see the entire recipe, click here! Love Sangria!! It’s perfect for Summer 😉 great post!! Yummy! 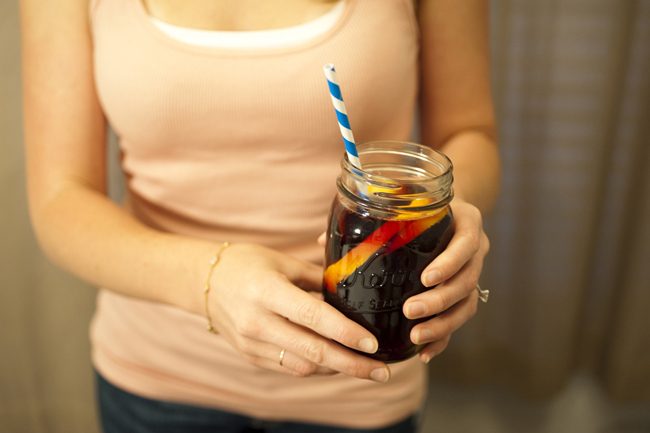 I have been looking for a sangria recipe. Can’t wait to give this a try. This sounds very good. Can’t wait to try some on my own and enjoy it on my next opportunity to sit outside and just enjoy the warm summer evening. i will definitely be making one of these SOON! yum yum! Erin’s styling is always on point! 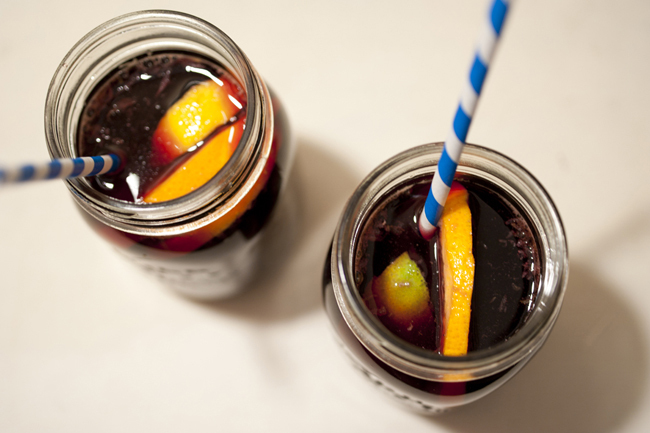 Though now I have a serious hankering for a seat on a porch and a mason jar of sangria!